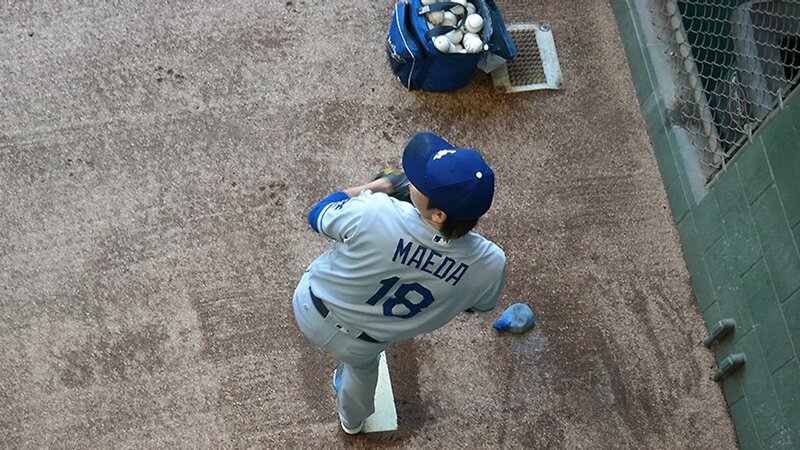 "Kenta had his breaking ball working, he threw good changeups," said manager Dave Roberts. "For him to give us six innings [was] huge for the 'pen." BTW, Corey Seager continues to rake. He slammed his 17th home run of the season (a two-run shot), walked and singled to extend his hitting streak to thirteen games. Watch him chat about his day with Alanna Rizzo here. This Day in Dodger History: In 1948 Roy Campanella made his Major League debut with the Brooklyn Dodgers. He caught Ralph Branca and hit a double and two singles. In 2011 Dee Gordon completed a stolen base cycle. During the seventh inning he reached base on a force out, stole second, then stole third, and finally swiped home with Casey Blake at the plate. Gordon is the 40th Major Leaguer to accomplish this in the same frame. Via Ken Gurnick at MLB.com; "Pederson only has bruise, but may go on DL." "We'll make a decision as far as what we do with Joc and the roster in the next day or two," manager Dave Roberts said on Thursday. Via Eric Stephen at True Blue LA; "Rob Segedin named to Pacific Coast League All-Star team." Via Jon Weisman at Dodger Insider; "Clayton Kershaw to avoid back surgery." Via Doug Padilla at ESPN; "Dodgers know it will take a village without Clayton Kershaw." Via jodes0405 at Gaslamp Ball; "Tony Gwynn Museum at AleSmith Brewing Co. will open Friday, July 8th." 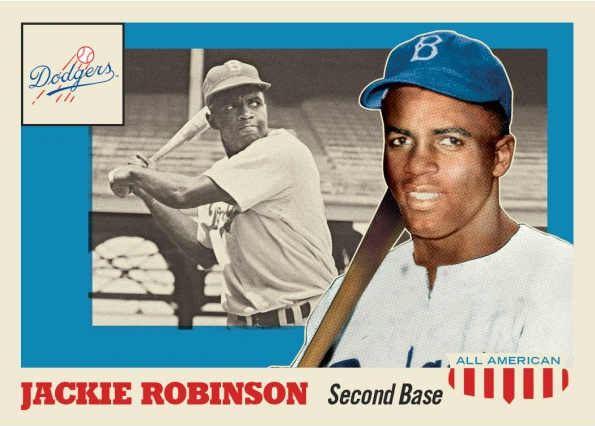 Available directly from Topps for the next week is a six-card throwback set featuring two Dodger legends on the vintage 1955 Topps All-American Football card design. 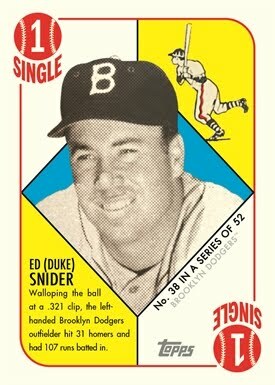 Check out what the Jackie Robinson and Duke Snider cards look like below. Go here to order. Via Lindsay Gibbs at Think Progress; "Republican Congressman Really Wants To Keep Minor League Baseball Players Below The Poverty Line." 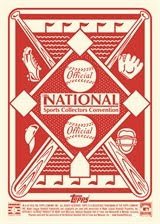 As many of you collectors surely know, the National Sports Collectors Convention in Atlantic City is coming next weekend. 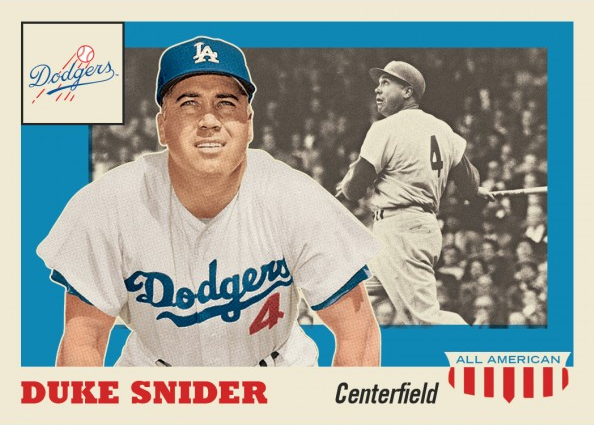 As a part of the festivities, Topps is handing out a six-card promo set to VIP attendees, and Dodger legend Duke Snider is a part of it. Check it out below. As you can see, they use the 1951 Topps Red Back Baseball card design. Go here for info on the convention.